For other uses, see Blancmange (disambiguation). Blancmange (/bləˈmɒnʒ/ or /bləˈmɑːndʒ/, from French blanc-manger French pronunciation: ​[blɑ̃mɑ̃ʒe]) is a sweet dessert commonly made with milk or cream and sugar thickened with gelatin, cornstarch or Irish moss (a source of carrageenan), and often flavoured with almonds. It is usually set in a mould and served cold. Although traditionally white, blancmanges are frequently given alternative colours. 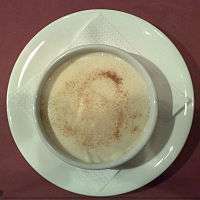 Some similar desserts are Bavarian cream, vanilla pudding (in US usage), panna cotta, annin tofu, the Turkish muhallebi, and haupia. The historical blancmange originated some time in the Middle Ages and usually consisted of capon or chicken, milk or almond milk, rice and sugar and was considered to be an ideal food for the sick. Tavuk göğsü is a sweet contemporary Turkish pudding made with shredded chicken, similar to the medieval European dish. The true origin of the blancmange is obscure, but it is believed by some that it was a result of the Arab introduction of rice and almonds in early medieval Europe. However, there is no evidence of the existence of any similar Arab dishes from that period; though the Arabic mahallabīyah is similar, its origins are uncertain. Variants of the dish appear in numerous other European cultures with closely related names including Biancomangiare in Italy and Manjar Blanco in Spain. Additionally, related or similar dishes have existed in other areas of Europe under different names, such as the 13th-century Danish hwit moos ("white mush"), and the Anglo-Norman blanc desirree ("white Syrian dish"); Dutch calijs (from Latin colare, "to strain") was known in English as cullis and in French as coulis, and was based on cooked and then strained poultry. The oldest recipe found so far for blancmange is from a copy of the oldest extant Danish cookbook, written by Henrik Harpestræng, who died in 1244, which dates it to the early 13th century at the latest. The Danish work may simply be a translation of a German work which is in turn assumed to have been based on a Latin or Romance vernacular manuscript from the 12th century or even earlier. The "whitedish" (from the original Old French term blanc mangier) was an upper-class dish common to most of Europe during the Middle Ages and early modern period. It occurs in countless variations from recipe collections from all over Europe and is mentioned in the prologue to Geoffrey Chaucer's Canterbury Tales and in an early 15th-century cookbook written by the chefs of Richard II. The basic ingredients were milk or almond milk, sugar and shredded chicken (usually capon) or fish, and often combined with rosewater, rice flour, and mixed into a bland stew. Almond milk and fish were used as substitutes for the other animal products on fast days and Lent. It was also often flavored with spices like saffron or cinnamon and the chicken could be exchanged for various types of fowl, like quail or partridge. Spices were often used in recipes of the later Middle Ages since they were considered highly prestigious. The whitedish was one of the preparations that could be found in recipe collections all over Europe and one of the few truly international dishes of medieval and early modern Europe. On festive occasions and among the upper classes, whitedishes were often rendered more festive by various colouring agents: the reddish-golden yellow of saffron; green with various herbs; or sandalwood for russet. In 14th-century France, parti-colouring, the use of two bright contrasting colours on the same plate, was especially popular and was described by Guillaume Tirel (also known as Taillevent), one of the primary authors of the later editions of Le Viandier. The brightly coloured whitedishes were one of the most common of the early entremets, edibles that were intended to entertain and delight through a gaudy appearance, as much as through flavour. In the 17th century, the whitedish evolved into a meatless dessert pudding with cream and eggs and, later, gelatin. In the 19th century, arrowroot and cornflour were added and the dish evolved into the modern blancmange. Though it is fairly certain that the etymology is indeed "white dish", medieval sources are not always consistent as to the actual colour of the dish. Food scholar Terence Scully has proposed the alternative etymology of bland mangier, "bland dish", reflecting its often mild and "dainty" (in this context meaning refined and aristocratic) taste and popularity as a sick dish. ↑ "Irish Moss Blanc-Mange. Farmer, Fannie Merritt. 1918. The Boston Cooking School Cookbook". Bartleby.com. Retrieved 2012-11-13. ↑ Hieatt, Constance B. (1995) Food in the Middle Ages, "Sorting Through the Titles of Medieval Dishes: What Is, or Is Not, a 'Blanc Manger'" p. 25-43. A nineteenth century transcription can be found in Henrik Harpestreng, Christian Molbec (1826) Danske Lägebog fra det trettende Aarhundrede, p. 157. ↑ "Richard II porpoise recipe online". BBC News. 2009-06-18. Retrieved 2012-11-13. Ossa, Germán Patiño (2007). Fogón de negros: cocina y cultura en una región latinoamericana. 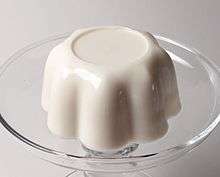 Wikimedia Commons has media related to Blancmange.